Original photo from John Hennes. 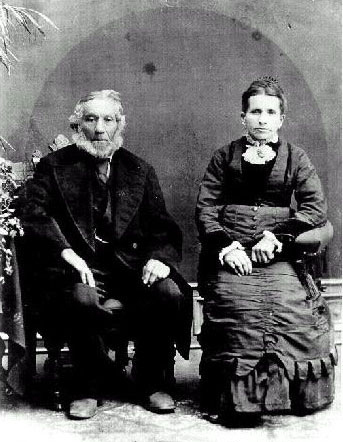 This is a photo taken prior to 1882 of David's great-grandparents, John and Wilhelmena Mather. John was born January 29, 1806 in Ostheim, France. 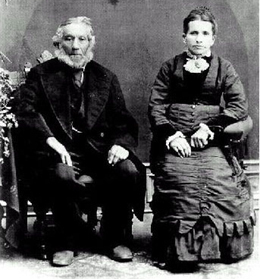 He married Cecile Brobecker in Ostheim and came to the U.S. in 1847 with her and five children. John and four children were listed in the 1850 Illinois census as living in Downers Grove. Presumably Cecile and one child died before the census. John married Wilhelmena in 1862. "My great-grandfather John Mather (Maether, Mader) was born in Ostheim in 1806, married Cecile Brobecker in 1836 and had many children in Ostheim, some of which died there. They came to the US in 1847 (Spring?) to New York and then to Downers Grove,Illinois, a South-Western suburb of Chicago. In the 1850 Illinois Census only John and four children were mentioned, Cecile and one child had died since they left Ostheim. The four children married and I have some information on them. John remarried in 1862. Wilhelmena Krueger was his second wife, my great-grandmother, and they lived in the Lemont,Illinois area. I feel that many people came from Alsace to the Downers Grove-Lemont area. One of John's daughters who came from Ostheim married Antoine Hoffert also from Ostheim in Downers Grove in 1857. They probably knew each other in Ostheim before they left. I tried to find them on the passenger lists but had no luck. The Mather family did not originate in Ostheim, John's grandfather came from Houssen which is nearby. His ancestors came from Durmenach which is farther South in Alsace near Basle. When John and his family came to the US in 1847, there were many Mather families living in Ostheim, today there are none."